Jay Wright Forrester was born on July 14, 1918, and grew up on a cattle ranch in Anselmo, Nebraska, USA. While in local high school, he built a wind-driven, 12-volt electrical system using old car parts, and it gave the ranch its first electric power. The program was initiated following a request from US Navy, asking the MIT Servomechanisms Laboratory to build an aerodynamic stability analyzer, which essentially was a primitive flight simulator. The pilot sat in a cockpit, pulled the joystick and the servos were supposed to respond in real time to his actions. The problem was to get it all to work fast enough to give the pilot a realistic feel for the plane. Initially Forrester and his group started building a large analog computer for the task, but soon found that it was slow, inaccurate and inflexible. Solving these problems in a general way would require a much larger system, perhaps one so large as to be impossible to construct. While thinking about the problems of fast analog computation Forrester heard (from a member of the MIT team, who saw a demonstration of ENIAC and suggested that a digital computer was the solution) about the digital computers being built by Mauchly, Eckert and John von Neumann (ENIAC and EDVAC). He talked to Eckert and Neumann and was convinced that a fast digital computer, built by electronic valves, was what was needed. 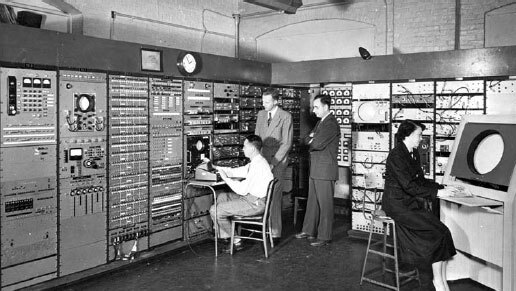 In early 1946 a digital computer project was started at the new laboratory, set up by Forrester, and speed was the absolute goal for this, what became known as the Whirlwind Project. At first Forrester planned to build a bit serial electronic computer like the EDVAC (EDVAC was a binary serial computer with automatic addition, subtraction, multiplication, programmed division and automatic checking with an ultrasonic serial memory), but soon realized that this would be slow. A bit serial computer works by calculating one bit at a time. This allows the same hardware to be re-used during a computation and so simplifies the design. The alternative is to use a bit parallel design that uses multiple copies of the basic hardware to compute an N-bit result in one operations. Bit parallel may be faster, but it needed so much more hardware that valve failure became a serious problem. 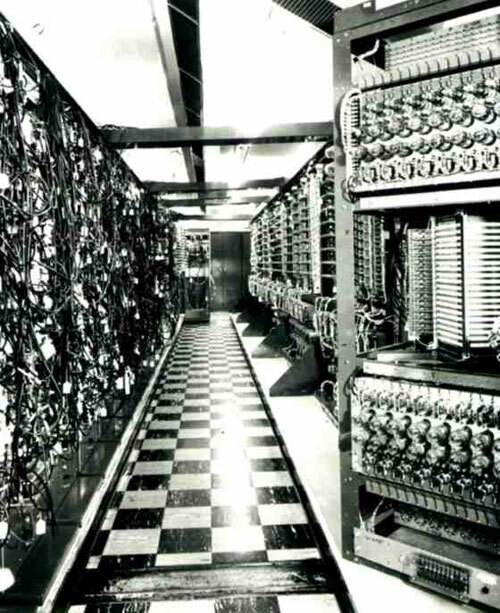 By 1947, Forrester and collaborator Robert Everett completed the design of a high-speed stored-program computer for this task—the Whirlwind. Construction of the machine started in 1948, an effort that employed 175 people, including 70 engineers and technicians. Whirlwind took 3 years to build and first went online on April 20, 1951. The project's budget was $1 million a year, and after three years the Navy had lost interest. However, during this time the Air Force had become interested in using computers to help the task of ground controlled interception (the Cold War just began), and the Whirlwind was the only machine suitable to the task. Forrester studied what made the valves fail after about 500 hours, which means regular breakdowns occurred, and discovered that the cause was the silicon added to make the refining of the nickel easier. Silicon free nickel cathodes increased the life of the average valve from 500 to 500000 hours. This discovery was a key factor, which made the Whirlwind possible. Another remarkable innovation increased the reliability of the machine still further. The Whirlwind could alter the voltage on the grid of each valve to test for imminent failures. Forrester had solved most of the problems in the design of Whirlwind but one remained—the memory. He realized that storage was the critical problem. The whole project depended on finding a more reliable and more economical method of storage. At the time most memory was serial, as it was in Edvac. The first fast large memories were based on mercury delay lines that kept a serial stream of bits circulating as sound pulses. The Williams tube, used in SSEM, was a faster version of the same principle. The speed of the original design of Whirlwind (20 KIPS) turned out to be too slow to be very useful, and most of the problem was attributed to the fairly slow speed of the Williams tubes for main memory of 256 words. A CRT display tube formed a pattern of bits as spots of light which was recirculated using a photocell and feedback amplifier. It was faster but the tubes burned out far too frequently. Initially Whirlwind used a modified form of the Williams tube. An additional flood gun maintained the pattern of dots while a writing gun was used to alter the pattern. Thirty two such tubes were needed to provide the 4KBytes of storage that the Whirlwind needed. Given a tube life of one month and cost $1000 the running cost of the machine was very high, $1 per bit per month. In 1949 Forrester started to think about ways of making a 2D or 3D form of storage rather than the one-dimensional recirculating method of storage represented by the delay line and Williams tube. After spending much time thinking about the problem, he encountered an article on the use of magnetic materials as amplifiers. He knew also about the pulse transfer controlling device of the Chinese engineer An Wang, which implemented write-after-read (essentially making magnetic core memory possible). Forrester ordered some of the material and built an array that passed current through rings of the material to magnetize it in one of two directions. This worked but it was too slow. Then the breakthrough happened! 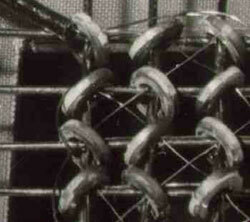 Forrester came up with a scheme that involved threading rings of the magnetic material on an x-y grid of wires. Each ring or core was threaded onto a unique pair of x-y wires (see the nearby photo). A third read/write wire was threaded through all of the cores. To read or write a bit half of the current needed to change the magnetization of a core was placed on one of the x wires and on one of the y wires. Only the core at the intersection of the two wires was subject to a current sufficient to change its polarity. This enabled a direct access to each bit in the array. Initially Forrester had doubts that it would work. Perhaps the repeated exposure to half the current needed to change the polarity would eventually cause a slow degradation in the state of the core. It didn't and coincident current core memory worked! A special test bed computer was built just to verify the principle. Then in 1953 Whirlwind was equipped with a new core memory that doubled its speed (up to 40 KIPS), improved its reliability and made it cheaper to keep running. In 1951 Forrester applied for a patent, which was granted in 1956 (see the patent US2736880). After its debut in Whirlwind, the magnetic core memory was used in computers until the beginning of 1970s. Jay Forrester is working on Whirlwind. The woman is working on the 16-inch Whirlwind Display Console. The Whirlwind was the fastest machine of his time. Its list of "firsts" are long and impressive but what really matters is the simple fact that the Whirlwind was the first computer capable of real time computations. It could add two 16-bit numbers in two microseconds and could multiply them in twenty microseconds. Of course the Whirlwind was huge but it only used 4000 valves, which was less than a quarter of the valves used in ENIAC—a much less powerful machine. The instructions and data are entered into the memory by means of switches or with a perforated tape. As a additional memory can be used a magnetic drum (8KB), as well as a magnetic tape device. Whirlwind was also the first computer, which used a graphical display (with resolution 256x256 dots). Whirlwind was the first computer, which used a revolutionary new device—the light pen (see the nearby image), which will flourish in its successor—SAGE, to identify aircraft of interest by selecting them on the CRT. 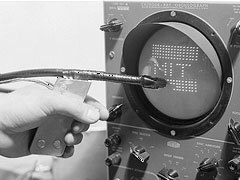 The light pen was developed in the early 1950s by a Lincoln Lab, Lexington, MA. engineer—Robert R. Everett (an assistant of Forrester, who will play a major role in the SAGE project also), who was charged with the task to develop a device, to read the position of a dot on the screen of the Whirlwind computer for diagnostic purposes. The light pen sensed light on the CRT screen and caused a computer interrupt to occur. This process occurred in just a few microseconds, but it was enough time that the computer could identify the specific graphical item that had been pointed to. Forrester left the project in 1956, when it was running smoothly through its final stages. His next brainchild, the monstrous SAGE computer system began operation in 1960s and was used as an air defense system until the 1980s. Forrester now made a career change that at first glance was surprising. He became a professor at MIT's Sloan School of Management. But applying his engineering view of electrical systems to the field of human systems would break new ground. Forrester focused on concrete experimental studies of organizational policy. He used computer simulations to analyze social systems and predict the implications of different models. This method came to be called "system dynamics," and Forrester came to be recognized as its creator. It has been applied in a wide range of fields. In the 1970s, Forrester applied it to global problems, concluding that industrialization was as big a problem as overpopulation in upsetting global equilibrium. He published several books on systems dynamics, and has received numerous awards and honorary degrees. 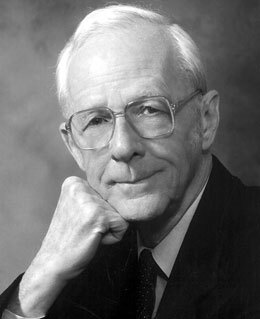 In 1982, Forrester received the IEEE Computer Pioneer Award, in 1989, he received the National Medal of Technology, in 2006, he was inducted into the Operational Research Hall of Fame.